Rent Boom Blasters balloon popping game modeled after the multi player trailer carnival game. A fast pumping balloon popping race to the finish. Talk of the Town entertainment amusement rental company Rockville MD 301-738-9500. 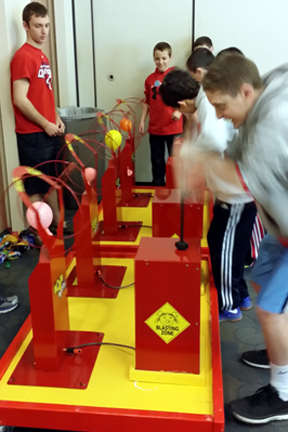 Boom Blasters - Similar to a game off the carnival midway, this fast pumping, balloon popping, race to the finish is great fun for everyone! Each set (3 available) comes with 2 pumping stations, so up to 6 contestants can play at once (typical set up is 4 stations). Contestants pump as fast as they can to inflate their balloons until they reach the balloon bursting arches. First balloon to burst, wins! Includes: 4 pumping stations, and 9" balloons. Attendant may be hired for an additional fee. Great for ages 5 & up. If you like this multi-player carnival game, you might like these games, too: Urban Hoops, Strike A Light, Quack Attack, and more!